Secondary lymphatic Tissues control the quality of immune responses. Differences among the various lymphatic tissues significantly affect the form of immunity and relate to how antigens are acquired by these organs. Lymph nodes are filters of lymph, the spleen is a filter of blood and mucosal associated lymphatic tissues acquire antigens by transcytosis to lymphoid tissue from the "external" environment across specialized follicle-associated epithelial cells. Caption: This drawing simplifies structures and connections of secondary lymphatic tissues where antigen may most efficiently direct immune responses. Multiple known and unknown factors intrinsic to the microenvironments of lymph node, spleen and mucosa associated lymphatic tissue (here MALT is represented by Peyer's patches) influence whether a "peripheral" or "mucosal" type of response occurs. 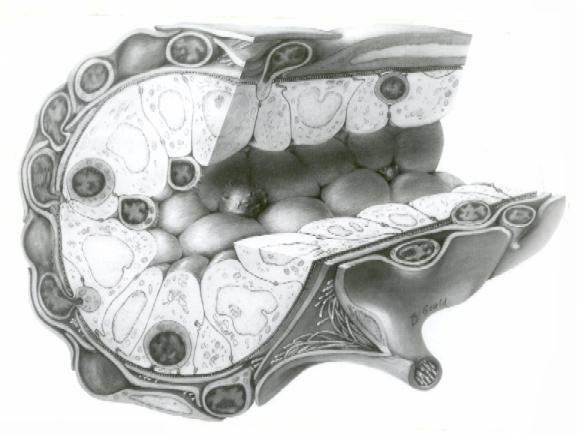 The drawing also indicates that these tissues are integrated with each other and the rest of the individual through vascular and lymphatic connections and a system of lymphocyte recirculation. Microenvironmental structures in the drawing are identified by the symbols below. SKIN AND DIFFUSE LYMPHATIC TISSUES. Skin and epithelial surfaces are the first line of defense against antigens in the environment which threaten an organism's integrity. Epithelium with underlying loose connective tissue, blood vessels and lymphatics may be considered part of the diffuse lymphatic system, especially for contact sensitizing antigens that fix to epithelial cells. The primary function of epithelium used to be regarded as a physical barrier but recently it has been shown to permit passage of drugs and antigens at a slow rate. Keratinocytes, mononuclear cells and nerve endings in the skin secrete numerous factors that may attract, activate and effect differentiation of T-cells locally or in regional lymph nodes. Lymphocytes and Thy-l+ dendritic epidermal cells are infrequently seen in the dermis or in intra-epidermal locations of normal skin. Because of the vast surface area the total number of lymphocytes in the skin may be great despite the small numbers in any single location. Although there is considerable speculation about homing of lymphocytes to the skin, few are present in afferent lymph. Langerhans cells populate the epithelial layer above basal cells and keratinocytes in a uniformally distributed pattern presumably limited by contacts between extended dendritic processes. Taken together it appears that the skin has become a transducer and gatherer of environmental information for transmission to regional lymphatic tissues. Mononuclear phagocytes are usually found in perivenular locations in the superficial dermis. Precursors for Langerhans cells and monocytes enter the skin from the blood to replace cells that regularly exit into the afferent lymph of regional lymph nodes. Secondary Lymphoid-Tissue Chemokine (SLC) and CC Chemokine Receptor 7 (CCR7) appear to participate in the emigration pathway of mature dendritic cells from the skin to regional lymph nodes [Reference and PDF]. The mean turnover time of Langerhans cells in mouse skin is about three weeks. Langerhans cells in afferent lymph draining the skin are regarded as the sentinels of skin-associated lymph tissue. The so-called passenger leukocyte that initiates allograft rejection via antigen/Class I MHC expression is also a Langerhans cell, and removal of the cell or ablation of the afferent lymphatics prevents sensitization. The underlying connective tissue of skin is transformed into a "lymph node-like" microenvironment by alterations in the microvasculature and reticulum to accomodate local recirculation, lodging and proliferation of lymphocytes in situation where deposited antigen persists. Therefore, the skin has a barrier and sentinel function which depend upon a constant traffic of lymphocytes Langerhans cells and mononuclear cells through the skin and into regional lymph nodes via afferent lymph. LYMPH AND LYMPHATICS. Lymph is a clear body fluid which clots like blood. Lymph forms when dissolved proteins and solutes filter out of venules and capillaries because of local differences in luminal hydrostatic and osmotic pressure. Whenever the epithelial barrier is broached, the neuropeptide "substance P" is released by axons and increases lymph production through hyperemic effects. Hyperemia increases fluid transudate. This aids fluid transport to the regional lymph node of cells, antigens and cytokines. Afferent lymphatic vessels have their origins in the reticular connective tissue beneath the epithelium of the skin, gut, and urogenital tract and within the mesenchymal tissues of all organs. The endothelial cells of lymphatics are anchored to the surrounding reticular fiber meshwork, causing the lymphatics to dilate rather than collapse when tissue hydrostatic pressure exceeds the pressure of fluid in the lymphatic. This opens valve-like junctions between endothelial cells and allows intravasation of tissue fluids. Lymph flows unidirectionally toward lymph nodes because valves prevent back flow under normal physiological conditions. Lymph capillaries merge into larger lymphatics which drain into lymph nodes. Efferent lymph from regional lymph nodes may drain into one or more additional nodes before flowing into major efferent lymphatics. The thoracic duct carries lymph draining from the gut and the lower half of the body. For additional information on the thoracic duct, click on thoracic duct. The main function of lymph nodes is to trap antigens and cells containing antigen that flow into them via afferent lymphatics and to provide a site for clonal expansion of lymphoid cells recruited from the millions of cells that enter and leave via various routes. However, lymph nodes have different ways of handling cells, solutes and particles as sources of antigens that will be presented. Lymph nodes are connective tissue bags filled with mobile cells organized into functional compartments by a meshwork of reticulin fibers ensheathed by fibroblastic reticular cells; and, supplied by a system of specialized blood vessels and nerves. 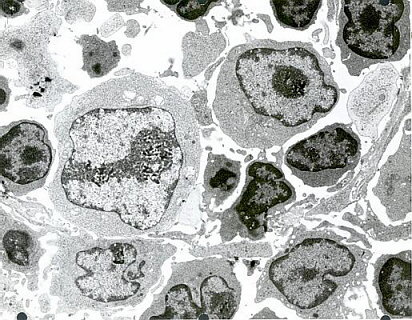 A "cortex" and "medulla" is distinguishable in histological preparations by the relative density of small lymphoid cells contained in the reticular matrix. The superficial cortex contains a lymphatic sinus, macrophage rich zone and B-cell follicles. The deep cortex is a high traffic zone where migrant or recirculating T- and B lymphocytes enter from the blood. Lymphocytes in the deep cortex are directed toward specific B or T-cell microenvironments by fibroblastic reticular cell corridors where the lymphocytes encounter antigen presenting cells. If they are not activated by antigen displayed in Class II MHC along with costimulatory signals the T- or B-cells crawl into lymphatic channels and out of the lymph node (Sinha PDF). The medullary cords contain sessile B-lymphoblasts and plasma cells which accumulate there after immune reactions and the medullary lymph sinuses are the highways out of the lymph node. The cortex is organized into hemispheric lobules where the flat surfaces face the afferent lymph supply and the round central borders merge with stromal chords and sinuses to form the medulla. Cortical lobules in lymph nodes of all mammalian species have a constant vertical dimension (for more detail on structure of "cortical lobules" see Gretz et.al.,1997) The lateral dimensions of cortical lobules are highly variable which accounts for the rapid 2-4 fold node enlargement that occurs 6-18 hours after antigen inoculation. ANTIGEN ACQUISITION AND PRESENTATION. Afferent lymph drains into a flat lymphatic antechamber, (the subcapsular sinus) which distributes the lymph over the superior surface of cortical lobules packed with lymphocytes, scattered macrophages and interdigitating dendritic cells. 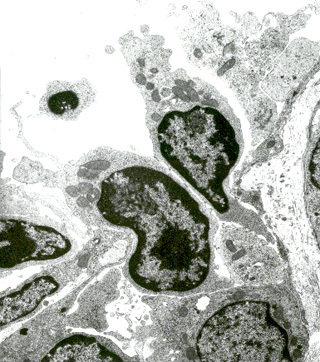 Motile cells (DC and Monocytes), transporting presentable antigens, crawl directly into the superficial cortex by passing through "pores" in the floor of the subcapsular sinus. Larger particles and dead cells pass into lymphatic capillaries (cortical sinuses) that form an extensive perivenular plexus in the deep cortex before emptying into the medullary sinuses. These cortical sinuses define the boundaries of "cortical cords." There is considerable phagocytic activity at all portals of free antigen access to lymph nodes. This limits the amount of particulate antigen that could access the cortical T- and B cells. Soluble materials should "diffuse down" into the cortex but this is not obvious. Instead, one sees soluble labels staining the fibroblastic reticulum that courses directly from lymph sinus wall to the perivenular channels of HEV (Anderson and Anderson, 1975; Anderson and Shaw, 1993). Macrophages are found in the subcapsular sinus near the pores and suspended from reticular fibers that cross the lymphatic channels. Macrophages are also prevalent in the large lymphatic sinuses in the medulla. Antigens that escape phagocytosis within a lymph node face phagocytosis in other lymph nodes through which the lymph must pass before entering major efferent collecting ducts. Antigens that succeed in eluding lymph node entrapment will ultimately be captured by blood monocytes or macrophages in the spleen, liver or bone marrow. Mononuclear cells spaced throughout the deep cortex participate in antigen processing and presentation. Not all macrophages in these sites express surface Ia-antigen or perform antigen presentation functions. Interdigitating dendritic cells (IDC) constitutively express Ia-antigen and exhibit physical contacts with macrophages and numerous cortical T-cells. This capacity to distribute its cell surface over numerous lymphocytes may explain the IDC's relative effectiveness in stimulating mixed lymphocyte culture reactions (Steinman 1997). Although the full repertoir of cytokines secreted by, or affecting IDC are not known, the macrophages located near IDC may have a positive effect by secreting cytokines that enhance interaction and stimulation of T cells by IDC. It is now believed that interdigitating dendritic cells are derived from Langerhans cells which migrate into lymph node cortex from the skin. It is also possible that local differentiation of a migrant precursor cell in presence of GM-CSF, or gene switching of daughter cells produced through local division of resident mononuclear cells may be involved. Fibroblastic reticular cells in lymph nodes also bind antigen without phagocytosis. Three to four days after inoculation, labeled antigens are found on the surfaces of dendritic cells within B-cell areas of the lymph node cortex. Cytophilic antibody (Fc receptors) and complement (C3b receptors) facilitate binding of antigen by the dendritic cells within germinal centers of B-cell follicles. Antigen remains bound to follicular dendritic cells for a long time and the same antigen will bind to these cells with greater avidity on secondary exposure, presumably due to cytophilic antibody. The molecular mechanisms of antigen presentation by accessory cells after primary exposure to T-dependent antigens has recently been described. Ia-antigen itself is a "receptor" for immunogenic peptides produced after the antigen is degraded in an acidic lysomal compartment. Presumably, Ia-antigen is a transport protein that collects degraded peptides in Golgi-associated lysosomes and shuttles them to the cell surface to be presened to helper T-cells. Thus the "processed" immunogenic determinants are selected by the antigen presenting cell. B-cells may also present antigen to Tcells when membrane immunoglobulin captures antigen rather than presents it. The requirement for MHC restriction in provision of T-cell help for B-cell responses anticipated coordinate recognition of class II MHC and antigen by helper T-cells. Uptake of antigen by the B-cell also results in processing and presentation of antigenic epitopes via Ia-antigen just as in "antigen presenting cells", and capture and presentation of antigen is greatest when the B-cell membrane immunoglobulin is specific for the antigen. GERMINAL FOLLICLES. Germinal follicles are discrete lymphoid compartments where B-cells (that are reacting to T-dependent antigens) undergo division, isotype switching and memory development. B-cell follicles are found in all peripheral lymphatic tissues including foci of chronic inflammation. Although some germinal follicles develop oligoclonally (i.e. As a manifestation of Frank Macfarlane Burnet's clonal selection theory as shown in one of this video from Walter and Eliza Hall Institute), there are far fewer germinal follicles than there are antigen reactivities among B-cells so it is possible that follicles have a "changing of the guard" periodically when new antigens trigger development of B cell memory. The stroma associated with the mantel zone and germinal center of B-cell follicles express the chemokine BCL (CXCL13) that is chemotactic for B-cells expressing CXCR5 receptor. "Activated" CD-4 T-cells have the CXCR5 receptor upregulated, presumably to enable antigen specific T-cell help for the reactive B-cells in the germinal center. In lymph nodes, B-cell follicles partially interrupt the subcapsular sinus in the superficial cortex. This location enables B-cells and mononuclear phagocytes to bind or take up antigen whereupon they can crawl into the Follicle Germinal Center. An alternative concept is that a subset of FRC conduits transport low molecular weight antigens to Follicular Dendritic Cells and B-cells within. A recent paper by Roozendaal et al illustrates how this may occur [Roozendaal, R. et. al. 2009. Conduits Mediate Transport of Low-Molecular-Weight Antigen to Lymph Node Follicles. Immunity 30: 264-276]. A germinal center develops in a follicle as proliferating B-cells displace the cortical reticular fibers into a basket-like enclosure that separates central lymphoblasts from the peripheral mantel of small B-cells (see SEM by Ushiki). Lymphoblasts, follicular dendritic cells and "tingible-body" macrophages reside inside the enclosure. Recent morphological and genetic analyses indicate that germinal center light zones (LZ) and dark zones (DZ) carry out somewhat different functions in B cell development (MacLennan 1994). On the outside of GC, the mantle zone is comprised almost entirely of small B-lymphocytes with IgM+/IgD surface phenotype. A sprinkling of Helper (L3T4, CD4) and Suppressor (Lyt-2, CD8) T-cells are also present in the mantel zone. In the germinal center the large B-lymphoblasts and intermediate cells have lost surface IgD. They now express IgM (80-90%) and another isotype such as IgG (30%); IgM+/IgD+ lymphocytes in follicular mantle zones have not yet switched while germinal center B-cells have. Therefore, it is likely that rearrangement of the immunoglobulin heavy chain genes occurs in (or en route to) germinal centers with mantle zone Bcells serving as a pre-switch pool. Switched B-cells initiate low level transcription of messenger RNA for the "secondary" isotype while still expressing membrane IgM. IgM is deleted and the "secondary" isotype is expressed usually after a second exposure to antigen. Inside germinal centers the activated B-cell sees antigen on follicular dendritic cells and receives help from CD-4+ T-cells and/or their factors. The frequency of CD-4+ T-cells in germinal follicles is small relative to B-cells but they outnumber CD-8+ T-cells 3:1. B-cells divide and migrate rapidly out of the follicle as lymphoblasts which leave the node via cortical lymphatic sinuses, efferent lymphatics and enter the blood before lodging in the spleen, inflammatory foci, and other lymphatic tissues (Video from Sinha, R.K. et al 2009). Some large IgM+ B-cells lodge in the marginal zone of the spleen and switch after they re-encounter antigen. Labeled B-lymphoblasts "home" to germinal centers without accumulating in the small cell mantle after intravenous infusion. This may replenish germinal centers with varieties of antigen specific clonal precursors, permitting follicular dendritic cells to present a single antigen to B-cells responsive to different epitopes, or the B-blasts may provide additional antigen presenting capacity if the B-cell happens to be binding and processing nominal antigen. LYMPH NODE VASCULATURE. The vasculature of the lymph node cortical lobules is specialized to meet the demands of a tissue populated by transient cells. Arterial vessels enter lymph nodes at the hilus and branch once or twice as they cross cortical lobules to supply a network of capillaries and arteriovenous communications running beneath the floor of the subcapsular sinus in the superficial cortex. 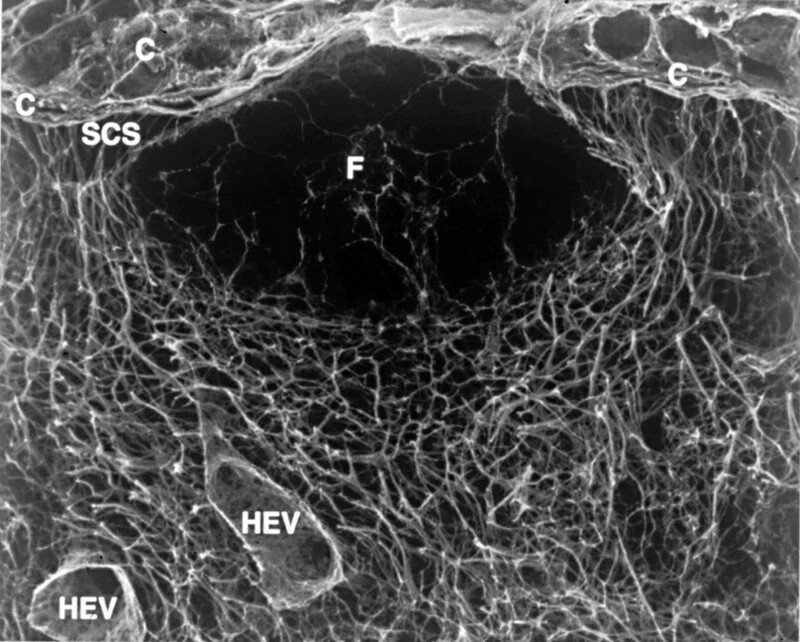 Arteriovenus communications and short segments postcapillary venules connect with HEV lined by plump polygonal endothelial cells. Distal segments of HEV open into elastic capacitance vessels draining segments of cortical lobules. These segmental veins merge to form lobular veins near the hilum. Circumferential smooth muscle bundles form contractile structures at sites where segmental and lobular veins join before connecting with the systemic circulation. These contractile vascular structures may prevent dramatic intranodal changes in blood flow from affecting systemic circulation. Studies of microvascular changes in stimulated lymph nodes demonstrated a biphasic shift in blood flow after antigen inoculation. An early transient increase in flow up to 30 times normal was attributed to hyperemia. The increased flow, caused by increased arteriovenous shunting resulted in increased lymphocyte traffic rates. This was followed by a second, more gradual wave of increased blood flow due to angiogenesis and enlargement of the network of HEV between 3 and 6 days after alloantigenic stimulation or after inoculation with adjuvants (Anderson et al 1975). The relationship of this angiogenesis response to dendritic cells and secretion of VEGF has recently been examined by Webster et al in the 21 July 2006 JExpMed) These antigen-induced alterations in the microcirculation directly affected transvascular lymphocyte migration into lymph nodes; initially, by increasing the rate of immigration; and, subsequently, by enlarging the surface area of HEV endothelium available for migration. Myelinated and unmyelinated nerve fibers are found coursing through the stroma of lymph nodes where they are associated with arteriovenous communications and venous sphincters. Recent studies clearly indicate that noradrenergic and peptidergic nerve fibers supply diffuse areas populated with lymphoid cells in addition to the vasculature. Bundles of nerve fibers enter lymph nodes at the hilus and follow arteries and veins to the floor of the subcapsular sinus where the nerves form a plexus. Noradrenergic fibers extend into the paracortex near lymphoid aggregates adjacent to HEV. Furthermore, norepinephrine which is depletable by 6hydroxydopamine is found in lymph nodes. Depletion of norepinephrine with that agent resulted in a diminished immune response in draining lymph nodes after subcutaneous injection of antigen (Felten et al 1984), suggesting an immunoregulatory role for the products of neural secretion in lymph nodes. LYMPHOCYTE MIGRATION INTO LYMPH NODES. Gowans and collaborators demonstrated that large-scale emigration of recirculating lymphocytes from blood to lymph occurs across the walls of HEV. Accumulation of lymphocytes in HEV lumens was due to selective adhesion of circulating lymphocytes to endothelial surfaces via receptor ligand-like interactions. Polymorphonuclear leukocytes never adhered to HEV in vivo unless the lymph node was involved in acute inflammation. 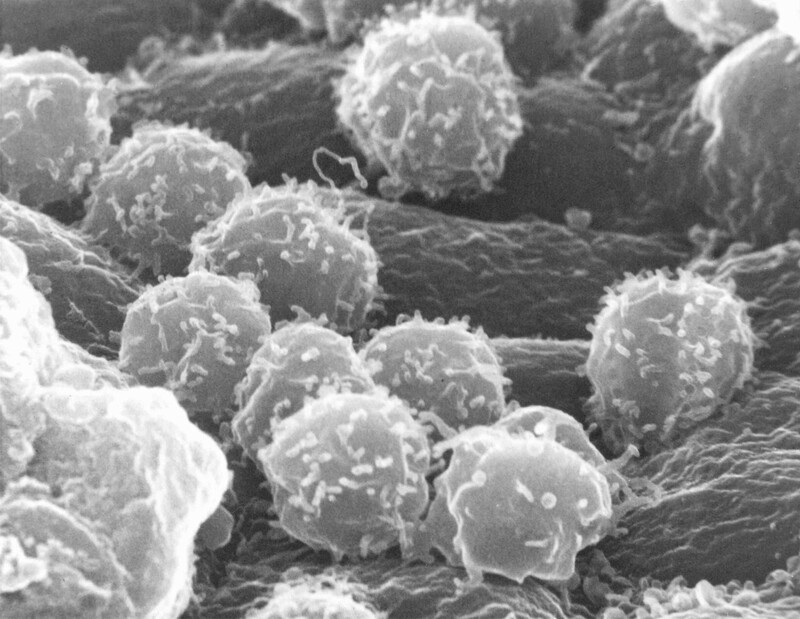 Lymphocytes adhered to HEV luminal surfaces via microvilli. This "tethering" gained strength as more microvilli interdigitated with pits on luminal surface of the endothelial cell. This kind of cell-cell interaction is effective in resisting hydrodynamic shear forces, and it involves receptors associated with the cytoskeleton. The existence of a glycoprotein "receptor" for recognition in lymphocyte homing was hypothesized a long while ago by Gesner and Ginsburg, and Marchesi and Gowans. Adhesion inhibition studies with monoclonal antibodies identified several lymphocyte membrane glycoproteins that may be responsible for organ - selective homing of lymphocytes in mucosal or peripheral lymphatic tissues. Continuation in this line of investigation has lead to a consensus hypothesis that is based sequential use of overlapping receptor - coreceptor pairs to form progressively stronger attachments to endothelium. The specificity of organ specific homing could result from specific combinations of complimentary adhesive molecules and a cascade of cell interactions. The original "Homing Receptors" that enabled "organ specific" lymphocyte homing are part of the consensus. Both MadCAM-1 (Mucosal Vascular Addressin) and PNad-1 (peripheral node adressin) are bound by alpha 4 beta 7 integrin and/or L-selectin because of specificity for sulfated carbohydrates. Specific oligosaccharides inhibited in vitro binding of lymphocytes to HEV thereby demonstrating that the lymphocyte receptor recognizes a carbohydrate moiety (Sialyl Lewis X) on the HEV. Caption: This illustration reflects the combinatorial adhesion cascade which has become the consensus hypothesis for explaining the process of lymphocyte emigration. Circulating lymphocytes use adhesive selectins to "roll" on the surfaces of endothelial cells. They become loosely "tethered" by selectin-glycam interactions. Upon activation either by receptors expressed on the endothelial surface or by chemokines, (chemotactic cytokines[PDF] that emanate from between endothelial cells), these receptors very rapidly change from low- to high-affinity binding capacity. Different specific receptor-counter receptor interactions are responsible for each stage and mediate recognition, binding and emigration of cells from the blood. The rolling cell binds, then begins to migrate between endothelial cells and enters the tissue. The full potential of such a "combinatorial" "adhesion cascade" is in explaining the apparent "homing" ability of lymphocytes as they return to specific anatomic sites according to "organ specific traffic patterns." Involvement of chemotaxis in triggering adhesion and directed locomotion was first proposed by Anderson and Anderson in 1976 and in a model for emigration that took into account that cytoskeletal integrity [PDF] was necessary for active emigration of lymphocytes into chemotactic gradients deposited between HEV endothelial cells. 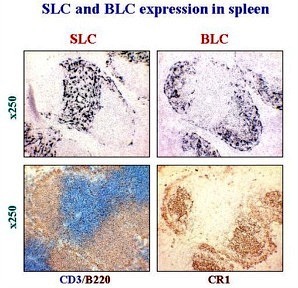 Recently, the chemokines SLC (Secondary Lymphoid Tissue Chemokine) and BLC (B Cell Lymphokine) were discovered to support recirculation of T- and B-cells which display the chemokine receptors CCR7 and CXCR5, respectively. While SLC is constitutively expressed on the luminal surfaces of HEV and by stromal elements within the deep cortex, BLC is expressed on stromal elements associated with B-cell follicles at the mantel zone and border with the germinal center [Science review by Jason Cyster]. Luminal lymphocytes polarize and squeeze between endothelial cells to enter a perivascular channel formed by the sheath of reticular cells. The unique permeability of the HEV from lymphatic tissue toward the blood permits cytokines or other factors in adjacent lymphatic tissue to diffuse along spaces between HEV endothelial cells to yield chemotactic gradients. Fibroblastic reticular cells ensheathing reticular fibers serve as conduits that carry "chemokines" and other factors directly to the HEV perivenular channels. This unique anatomic system provides for rapid and discrete communication between tissue and blood interface. When antigen inoculation causes altered blood flow, cytokine release, and increased tissue fluid pressures in regional lymph nodes, the resultant interendothelial gradient in HEV accelerates lymphocyte migration into the lymphatic tissue. 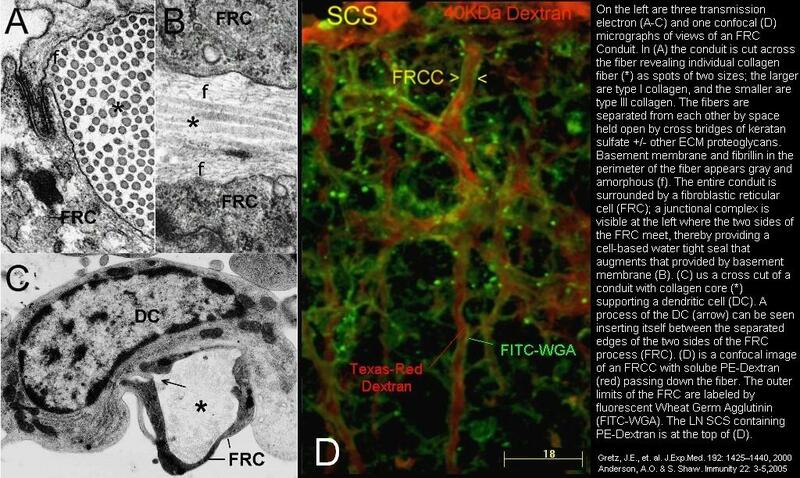 After squeezing out of perivenular channels into corridors and entering the deep cortical interstitium, lymphocytes crawl along cell processes and through a latticework of reticular fibers until they reach reactive foci in T- or B-cell areas. They also cross lymphatic endothelium to enter intermediary sinuses that deliver them into the efferent lymph. Contact guidance along fibroblastic reticular cells was proposed as a mechanism for intranodal redistribution of migrants because lymphocytes bind to these cells and migrate rapidly on their surfaces in vitro. Aggregation or repulsion of lymphocyte sets was also proposed to explain compartmentalization of lymphoid cells within lymphatic tissues. The precise mechanisms that govern accumulation and distribution of lymphocyte subsets within specific lymphoid compartments are not known. THE LYMPHOCYTE TRAFFIC DEPENDENT CORTEX. The deep cortex of lymph nodes, which appears in histological sections as a diffusely cellular area containing specialized vascular structures called high endothelial venules (HEV), has also been called the T dependent cortex T/B ANIMATION because of the adverse effect of neonatal thymectomy upon maturation of recirculating lymphocytes, and because a preponderance of T cells are present in immunohistological preparations. B cells also migrate into the deep cortex (they can be seen around HEV and en route to the superficial cortex). 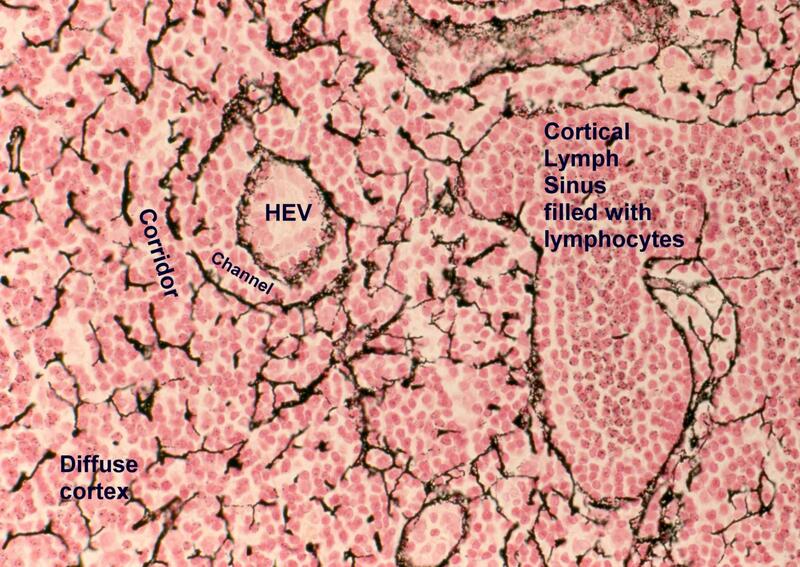 In "resting" lymph nodes the reticular connective tissue surrounding HEV contains numerous small lymphocytes in cords of reticular cell matrix between the HEV and lymphatic vessels of the cortical "intermediary" sinuses. 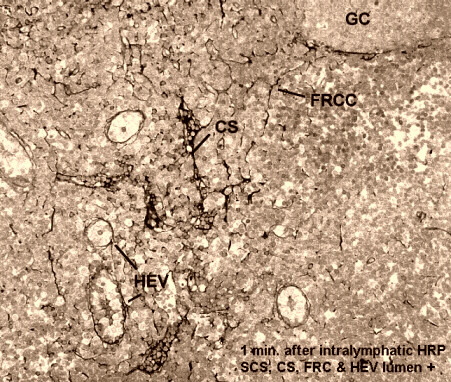 The size of the deep cortex depends upon the rate of lymphocyte immigration via HEV, the transit time of cells traversing the reticulum, and the rate of egress of immigrsnts vis efferent lymphatic channels. Indeed, the paracortex is capable of rapid 3 to 5 fold enlargement 6 to 24 hours after a strong stimulus induced by viral infection, injection or immunologic adjuvants, or inoculation of alloantigens. Accelerated lymphocyte traffic usually results in logjams of small lymphocytes in cortical sinuses. 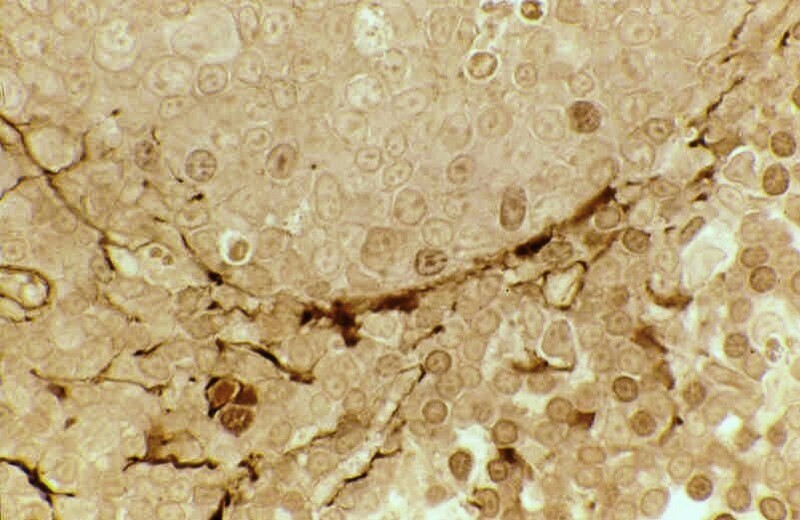 While most of the acute enlargement of the deep cortex during the first 24 hours after inoculation is due to increased lymphocyte traffic into the node, some of it is due to sequestration and activation of antigen reactive cells, causing them to remain to proliferate or release lymphokines. The outcome of this selection by antigen and cytokines is the subsequent outpouring of antigen reactive cells in the efferent lymph between 72 hours and 100 hours after inoculation. The two alternating images LINKED HERE are of lymph nodes from a normal rat and from a rat whose recirculating lymphocytes were depleted by continuous thoracic duct drainage for up to 14 days. Depletion of recirculating lymphocytes reduces a lymph node to its stromal and vascular components. The Paracortex is collapsed into a small mass of vessels and connective tissue. Germinal centers (follicle small lymphocyte mantle zones are absent) are all that remain of the B cell compartment. Both images are shown at exactly the same magnification. The deep cortex shrinks rapidly after chronic thoracic duct drainage or neonatal thymectomy. Both procedures are experimental manipulations that selectively deplete recirculating lymphocytes. Although the deep cortex is commonly known as the T-dependent cortex it is not comprised solely of T cells. The lymphocytes populating the deep cortex are about 75% T-cells and 25% B-cells, 90% of them are small lymphocytes and virtually all belong to the recirculating pool. Small B cells appear to migrate up to the superficial cortex after briefly accumulating around HEV. Small T cells move out through the perivenular channels into corridors of reticulum comprising the paracortex. There are slightly more CD8+ T-cells compared with CD4+ T-cells in resting lymph nodes but the ratio can vary considerably. This also applies to the ratio of T cells to B-cells. Normal T- and B-cell recirculation through lymph nodes seems to be under control of constitutively expressed "Secondary Lymphoid Tissue Chemokine (SLC) and "B-Lymphocyte Chemokine" (BLC), shown LINKED HERE in insitu hybridization preparations by Alexei Tumanov. After alloantigenic stimulation lymph nodes fill up with T-cells. In contrast, after inoculation of an antigen which selectively induces an antibody response, the deep cortex contains nearly 60% B-cells. Therefore, the deep cortex is a dynamic lymphatic compartment which responds to stimulation by cytokines, antigens, and other biological response modifiers. STRUCTURE OF THE SPLEEN. . The spleen filters blood and is the largest single lymphoid organ in the body. It has a dense fibrous capsule with muscular trabeculae extending inward to subdivide the spleen into lobules and provide anchors for the reticular meshwork supporting the cellular parenchyma. The spleen is grossly divisible into white pulp, formed of cylindrical collections of lymphocytes around the arteries, and red pulp, which contains erythrocyte-rich blood in cords of reticulum. The splenic cords are a continuous sponge-like reticular tissue which crisscross between fenestrated walls of splenic venous sinuses. The cords contain erythrocytes, lymphocytes, macrophages, granulocytes, and plasma cells. The splenic venous sinuses are lined by elongated endothelial cells that resemble barrel staves. The venous sinus wall is ringed by hoops of reticular fibers. All blood cells liberated into the splenic cords must squeeze through slits between these endothelial cells to enter the sinuses and return to the blood circulation. Splenic sinus lining cells express antigens associated with monocytes, macrophages, endothelial cells (Factor VIII, transferrin receptor), and T-lymphocytes. The spleen monitors for abnormal cells in blood by mechanical seiving in venous sinuses and exploration of surface antigens by mononuclear phagocytes. BLOOD AND LYMPH VASCULATURE OF THE SPLEEN. The spleen is supplied by the splenic artery which enters through the hilus and branches to pass through trabeculae into medium sized arteries surrounded by a sheath of lymphatic tissue (periarteriolar lymphatic sheath, PALS). These vessels terminate in small arterioles which pass through PALS and empty into the reticulum of the red pulp cords or pulp sinuses. Within the PALS narrow perpendicular branches of the central arteriole supply a ring of sinuses within the marginal zone of the PALS. These sinuses fill readily with radio opaque perfusates and materials used to make vascular corrosion casts for scanning electron microscopy; otherwise they would not be noticed. Marginal sinuses are critically important to lymphocyte recirculation in the spleen. Their supply vessels arise perpendicularly which may concentrate lymphoid cells through skimming the cells from the peripheral stream of the central arteriole. Blood from red pulp cords and marginal sinuses empties into the venous sinusoidal system which connects by gradual transition to pulp veins and spenic veins. The spleen has not afferent lymphatic vessels, but efferent lymphatics arise within the white pulp near central arterioles. The efferent lymphatics cross perpendicularly between PALS areas to form an interconnecting network in cleared preparations of spleens whose lymphatics are labeled with carbon. The structure of the lymphatic network provides for cellular communication among the anatomically separated white pulp areas. Lymphatic trunks pass through trabeculae, merge with each other, and exit at the hilus. Major efferent lymphatics of the spleen wind down the hilar blood vessels to join the thoracic duct near the thoracic duct near the pancreas. Parts of the intra-splenic lymphatic network have anatomical relationships resembling the "bridging zones" of Mitchell because they appear to link white pulp with red pulp in histological sections. Noradrenergic fibers enter the hilus of the spleen with the vasculature, follow the trabeculae and branching vasculature, and ramify mainly within the white pulp along the central arterioles and periarteriolar lymphatic sheath. Fibers branch from a dense periarterial plexus to permeate and terminate among diffuse small lymphoid cells and accessory cells in the PALS. Immunocytochemical data indicate that nerve fibers with neuropeptide-Y, Met-enkephalin, cholecystokinin 8, and neurotensin immunoreactivity are present along the central artery with sparse fibers entering lymphoid tissue. Cholecystokinin-8 bearing fibers are more prevalent in the PALS, however. FUNCTIONS OF THE SPLEEN. The spleen receives a high proportion of the cardiac output which contributes to its effectiveness as a filter of blood and a site for lymphocyte recirculation and lodging. Filtration of efete cells, debris and microorganisms occurs primarily in the reticulum of the red pulp chords and in the seive-like endothelium of venous sinuses. Reticular cells provide anchoring sites for mononuclear phagocytes that perform reticuloendothelial functions in the red pulp and marginal zone. The white pulp of the spleen contains a peripheral lymphatic tissue microenvironment for antigen trapping, cellular collaboration, lymphocyte proliferation and antibody production in addition to providing young bone marrow emigrant B-cells a place to complete maturation. The spleen is the primary site for initiation of immune responses to antigens and pathogens that have invaded the blood stream in addition to being a partner in every other immune response in the body. Antigen-laden mononuclear cells and lymphoblasts, released into efferent lymph from other lymphatic tissues 48 to 100 hours after antigen priming, lodge in the spleen and set up satellite zones of T- and B-cell proliferation. During active immune responses lymphoblastic B-cells committed to plasma cell differentiation lodge in the red pulp cords and sinuses where they mature and commence secreting antibody. LYMPHOCYTE MIGRATION IN THE SPLEEN. Lymphocyte traffic in the spleen moves across a blood tissue interface into sites of antigen presentation in the marginal zone and periarteriolar lymphatic sheath. Antibodies, enzymes, and drugs that are known to block lymphocyte homing to lymph nodes do not interfere with entry of the PALS by recirculating lymphocytes. Many of the lymphocytes entering the spleen in the arterial blood bypass the white pulp and flow into the reticulum of the red pulp cords and sinuses to exit via the splenic vein. These cells are returned to the blood within 2 to 3 hours after entering the spleen. However, some small arterioles terminate in sinuses adjacent to the white pulp; others empty directly into the marginal zone. Lymphocytes in the marginal sinuses enter the marginal zone, leaving other leukocytes in the lumen to be carried away in the blood. Lymphocytes arriving in the marginal zone move across a vascular interface that is populated by antigen-binding macrophages and B-cells to enter the PALS. Once in the PALS, lymphocytes may remain within the spleen for up to 12 hours. The PALS is analogous to the lymph node paracortex because it contains recirculating T- and B- cells in addition to interdigitating dendritic cells. Segregation of T- and B-cells into discrete zones within the white pulp is not rigorous. Follicles located in the border between the PALS and the marginal zone contain predominantly B-cells, and more recirculating T- than B-cells are found in the PALS. 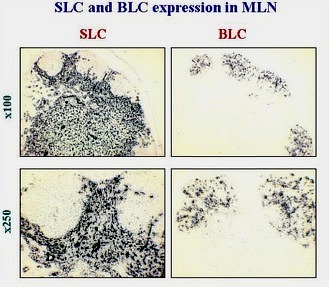 Recent molecular data indicate that fibroblastic reticular cell stroma associated with PALS and B-cell follicles selectively express SLC (T-cell attracting chemokine) and BLC (B-cell attracting chemokine), respectively LINKED HERE . Follicles in the spleen are identical to those described in the section on the lymph node. After variable periods of residence in the PALS, some recirculating cells exit through the efferent lymphatics, while others move into the red pulp sinuses. 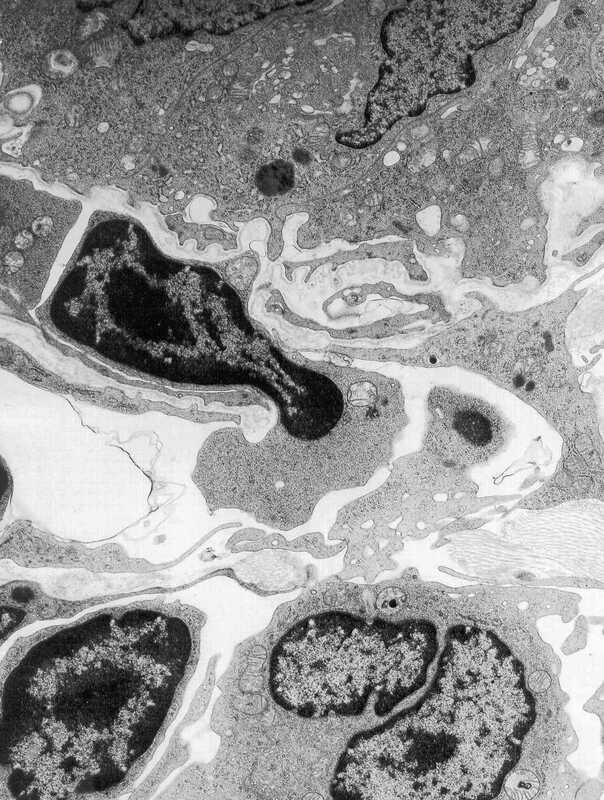 The magnitude of lymphocyte recirculation via efferent lymph versus venous return has not been determined, but traffic studies with viable lymphocytes whose motility has been arrested indicate that over 80% of the lymphocytes which leave the spleen in the venous blood never migrated into white pulp. If immunocompetant cells encounter an appropriate antigenic stimulus, they proliferate in the same manner as that seen in peripheral nodes; B-cells form large germinal centers and antibody secreting cells can be found within the splenic cords after migration through the blood or direct movement out from the white pulp. The marginal zone of the spleen contains a heterogenous assortment of mononuclear cells with specialized functions. A principal function of the marginal zone is antigen trapping. Intravenously injected tracer antigens reproducibly accumulate in marginal zones regardless of the nature of the antigen. A subset of macrophages in the marginal zone appear to be important in presenting type-2 thymus independent antigens to B-cells. These cells are capable of selective uptake and retention of iv injected RITC-ficoll. They are negative for surface Ia-antigen and expression of the macrophage-related F4/80 antigen. A splenic dendritic cell (Den-l), which is a potent accessory cell for some B-cell responses, has been cloned. This clone produces a unique cytokine that induces polyclonal B-cell proliferation in the absence of costimulators. The antibody forming cells generated by interaction of B-cells with these cells do not necessarily localize in the immediate proximity, however. The marginal zone contains specialized metallophilic macrophages that specifically label with a new monclonal antibody (MOMA-l). 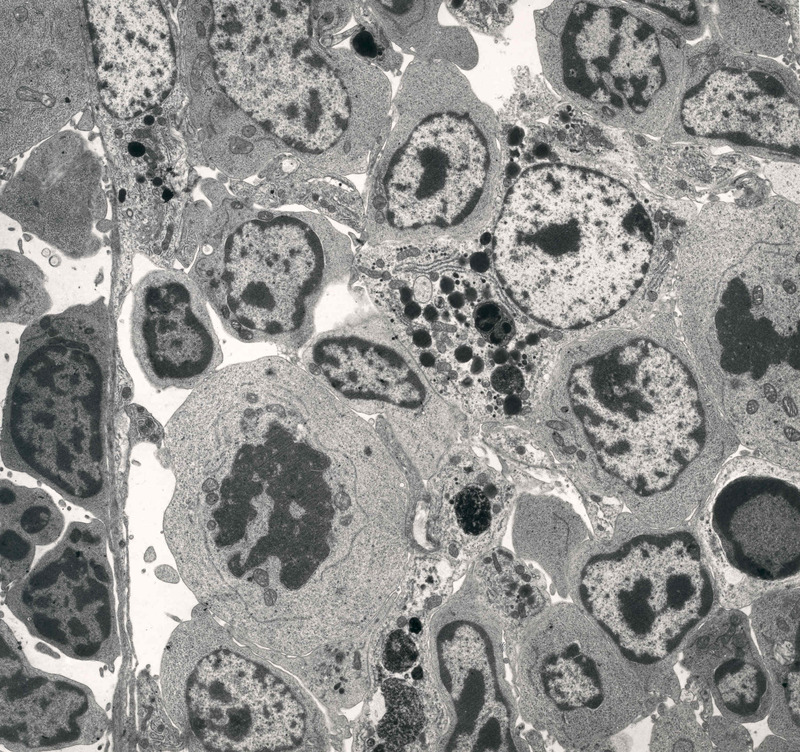 These cells form a ring around the periarteriolar sheath and follicular areas on the inner side of the marginal zone. 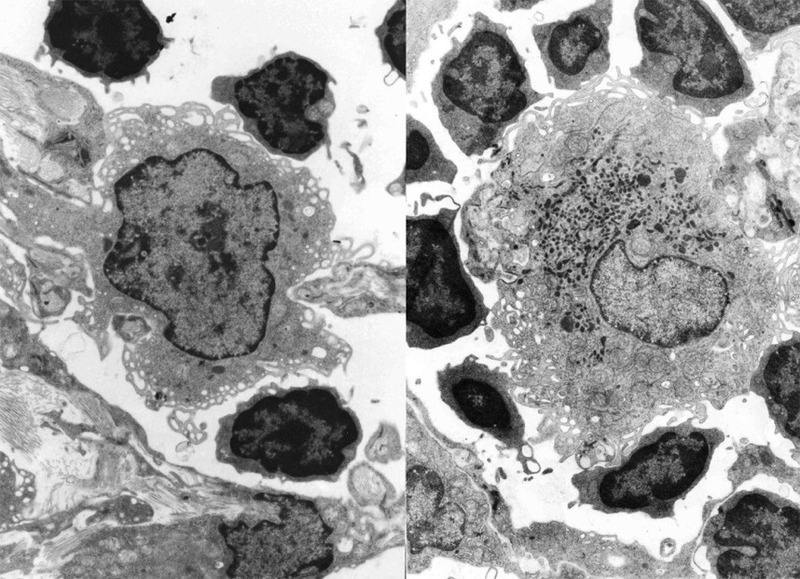 The same cells show high nonspecific esterase activity and can be distinguished from the marginal zone macrophages by MOMA-l staining and the lack of selective FITC-ficoll uptake. The marginal zone contains numerous B-cells which express membrane IgM+, IgD-, IL-2 receptors, have alkaline phosphatase on their surfaces and appear to be relatively sessile components of the marginal zone; i.e. they do not move into PALS unless stimulated by antigen to enter B cell follicles. Lipopolysaccharide (LPS) infusion rapidly depletes them from the marginal zone followed by expansion of the IgM+, IgD- cells in germinal centers. Depletion and regeneration of these cels following anti-IgM or IgD treatment permitted MacLennan to determine that the marginal zone IgM+, IgD- B-cells are post follicular IgM+, IgD+ cells because the follicle cells regenerated before any marginal zone B-cells appeared during recovery from B-cell depletion. This population of B-cells appears to be enriched in those that selectively respond to type-2 thymus independent antigens while the follicular Bcells respond to thymic dependent antigens. See a recent article from Ulrich Siebenlist's lab that analyzes how the p52 subunit of (NF)-kB transcription factor affects regulation of marginal zone and germinal center development using gene knock out mice (J. Exp. Med.187:147,'98). (Tonsils have 60% T-cells compared to 25%-40% T-cells in respiratory or intestinal patches) but the similarity of these tissues to Peyer's patches is greater than the difference, especially since all have "M" cells in their follicle associate epithelium. 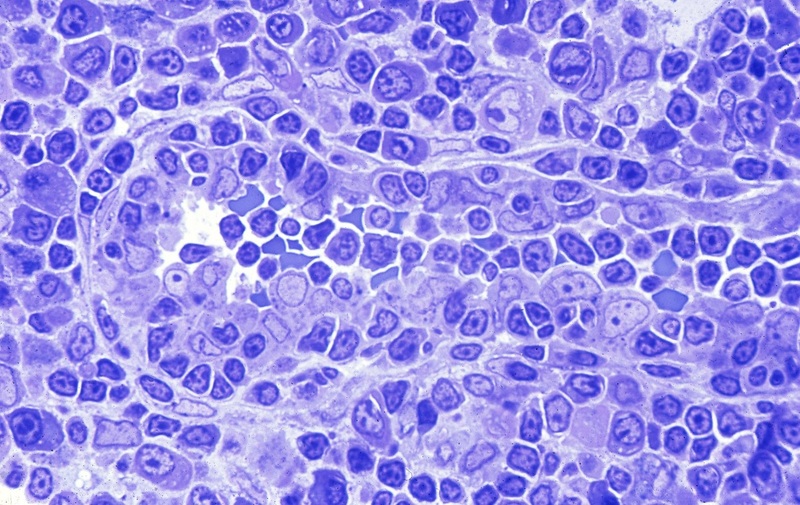 The prototypical Mucosal Lymphatic Tissue is the Peyer's patch which has a unique dome epithelium that is specialized to sample environmental antigens. Peyer's patches contain lymphoid compartments that are analogous to the deep cortex and follicles of lymph nodes, but there are no afferent lymphatics and no medullary cords for local accumulation of plasma cells (Parrott 1976). Each Peyer's patch contains multiple individual B-cell follicles separated by diffuse lymphoid tissue in interfollicular areas. FUNCTIONS OF MUCOSAL LYMPHATIC TISSUES. The mucosal immune system appears to have two paradoxically opposite immune purposes while also participating in continued diversification of the immunoglobulin repertoire. Mucosal lymphatic tissues amplify development of committed B-cells for secretory IgA responses to enviromental antigens IgA responses to environmental antigens and programs certain environmental antigens for systemic tolerance induction. The tolerance that results from mucosal immunization does not effect production of B-cells committed to IgA secretion. "Mucosal" tolerance is manifested by antigen-specific suppression of delayed cutaneous hypersensitivity and reduced IgG expression. The mucosal immune system therefore exerts a Yin Yang effect on local versus systemic immunity initiated in unique mucosal and peripheral lymphoid microenvironments. Cells retaining germline VH/VL and Fc genes are consistently recovered from mucosal (and splenic) lymphoid follicles, giving rise to suggestions that diversification of the immunoglobulin genes in a renewable early B-cell population may be an additional important function of lymphoid follicles in peripheral tissues like the spleen and mucosa associated lymphoid tissues. This type of "primary lymphoid" function is found in the Bursa of Fabricius in the Chicken. However, recently described similarities in structure, development and function were found among the Bursa, the Ileal Peyers Patch in the Sheep, and the appendix in the Rabbit and Human. Each of these structures become populated with lymphoid cells only after the respective species enters the "outside" world and comes in contact with environmental microbes and antigens. There has even been a suggestion that environmental microbes are essential stimulants for diversification of immunoglobulin genes. M-CELLS. The dome epithelium covering each follicle is composed of cuboidal absorptive epithelial cells interrupted by delicate membraneous cells which have luminal microfolds instead of microvillus borders. The "M" cells endocytose and transport various materials without lysomal degradation. Antigen is deposited into small lymphocytes, small mononuclear phagocytes and dendritic cells immediately beneath M-cells above the B-cell mantle of Peyer's patch germinal follicles. Minute quantities of intact antigen and products of digestion are transported to the lamina propria and lacteals by ordinary absorptive epithelial cells anywhere in the small bowel. It is important to point out that these products enter interfollicular areas and do not have access to the dome area. Between the dome epithelium and the follicles there is a thin region of reticulum, containing a delicate plexus of blood vessels and plasma cells. FOLLICLES. Peyer's patch follicles, located beneath the dome epithelium, have a mantle of small B-cells surrounding germinal centers that is thicker facing the dome. The germinal centers contain large and intermediate sized Blymphoblasts, follicular dendritic cells, macrophages and rare T-cells. Regardless how many follicles a patch contains, each is only one follicle thick, providing an intimate association with the overlying epithelium. Precursor B-cells with surface IgM and IgD enter Peyer's patches via HEV and migrate into the mantle zone above the germinal center where they may come in contact with dendritic cells and T-helper cells. Membrane IgD is lost when the B-cells enter the germinal center to begin proliferating. A small number of cells will express surface IgM with IgA or IgA alone but most will express only membrane IgM. Recent data indicate that switching and committment to IgA expression occurs in nearly 90Z of IgM only germinal center cells although surface phenotypes and antibody produced in short term culture does not reflect this committment. In situ hybridization with c DNA probes (for the rearranged RNA message of IgA) does not label any cells in the small cell mantel, lightly label all of the cells expressing surface IgM-only and heavily label a minority population which synthesize and secrete dimeric IgA. Immature "mucosal" B-cells exit Peyer's patches down mesenteric lymphatics to regional lymph node where they contact additional recirculating helper or immunoregulatory cells. Most B-cells pass out of the mesenteric node via efferent lymph to the blood. These cells temporarily lodge in the spleen where they proliferate and mature 5-7 days before returning to the lamina propria of the intestine and other mucosal sites. Once the B-cells reach the mucosa they divide once more and mature into IgA secreting plasma cells. LYMPHOCYTE TRAFFIC AREAS. The interfollicular areas are diffusely infiltrated with small and medium sized lymphocytes, usually of T-cell origin but numerous IgM+/IgD+ B-cells are also present. Recirculating lymphocytes emigrate from the blood into Peyer's patches via a network of HEV surrounding follicles. Lymphocyte recirculation across HEV in patches is very rapid. Accumulation of labeled lymphocytes peaks 90 minutes after infusion, which is the shortest transit time of any organized lymphatic tissue. Lymphocyte traffic to the patch is augmented by recirculation across venules which are not recognizable as HEV. Some lymphoid cells enter the lamina propria via thin-walled venules adjacent to intestinal crypts far away from the Peyer's patch and flow along submucosal lymphatics until they reach lymphatic plexuses in interfollicular areas. T-Lymphocyte traffic patterns related to mucosal and peripheral lymphatic tissues are segregated with some crossing over occurring in mesenteric lymph node and the spleen. Griscelli demonstrated the existence of two populations of T-lymphocytes which selectively migrated to the gut lamina propria when the cells came from mesenteric lymph node or the spleen when the cells came from a peripheral lymph node. These distinctive traffic circuits are also found with murine T- and B-lymphoblasts but not small T-cells which migrated randomly to mucosal or peripheral lymphatic tissues regardless of their origin. In sheep, small T-cells exhibited a pronounced asymetry of recirculation. Labeled small T-cells from intestinal lymph are twice as likely to be recovered in intestinal lymph than in nodal lymph, and vice versa. Furthermore, intestinal recirculating T-cells migrated through the small intesting while nodal T-cells did not. Similar lung-, gut- and peripheral lymph node associated traffic patterns were demonstrated in sheep by Spencer and Hall. Small B-cells and B-lymphoblasts show preference for migration into Peyer's patches and gut lamina propria, respectively. There is some preference for "secondary" B-cells to return to the mucosa where they first encountered antigen. However, B-cells committed to IgA expression lodge in laminae propriae of other mucosae anywhere in the body. This ability of Peyer's patch B-lymphoblasts to populate mucosal sites in the conjunctive, upper respiratory tract, bronchi, mammary glands, and gastrointestinal tracts is regarded as "The common mucosal immune system" where gut associated lymphatic tissues supply the bulk of the B-cells. The immunoregulatory T-cell component of this sytem is segregated into traffic patterns which permit crossregulation between peripheral and mucosal immune systems within the spleen and mesenteric lymph nodes. The innervation of Peyer's patches is extensive and the diversity of adrenergic and peptidergic nerve endings in patches is greater than for any other peripheral lymphatic tissue. Noradrenergic fibers enter at the serosal surface, course longitudinally with the muscularis, and form interfollicular plexuses which ramify through the diffuse T-dependent areas near HEV. 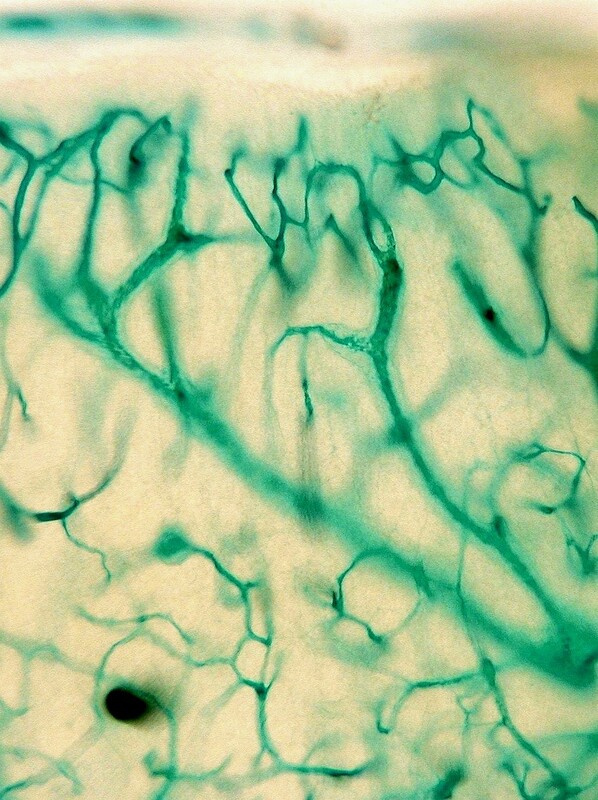 Fibers extend into the mushroom villi between the domes to supply enterochromaffin cells and plasma cells. Blood flow appears to be the limiting factor that determines lymphocyte extravasation in mucosal sites. 1983), and vasoactive intestinal peptide, present in peptidergic fibers in Peyer's patches, can modulate affinity of lymphocyte homing receptors for HEV; therefore, there probably is a role for the extensive innervation of Peyer's patches in regulating traffic and reactivity of mucosal T- and B-cells. IMMUNOGLOBULIN ISOTYPE COMMITTMENT. Cebra proposed that the special feature of mucosal lymphatic tissues that promotes the generation of IgA-only clonal precursors is an environment that allows antigen-driven division without maturation to plasma cells. The feature of the Peyer's patch environment that might promote this situation could include inaccessibility of T helper cells, excessive presence of T suppressor cells or humoral factors. The tempo of T-cell recirculation through mucosal lymphatic tissues is consistent with the segregation of antigentriggering and subsequent maturation of IgA precursors, compelled to migrate to various lymphatic tissues to complete differentiation. With a mean transit time through the Peyer's patches of under two hours T-cells do not remain long enough to participate in local maturation of IgM-expressing IgA-precursor cells. T-cells, carrier-primed by the same antigens as the B-cells in the Peyer's patches, catch up with IgA precursors in lymph sinuses of mesenteric nodes or in the spleen. T-helper cells that secrete IL-4 may provide isotype specific growth and maturation advantages to B-cells committed to IgA expression; but, they do not cause immunoglobulin heavy chain gene switching. Recent studies by Koltoff indicate that T-cells are effective in selectively enhancing growth of IgA-committed B-cells in bulk cultures but cannot cause IgM-only B-cells to switch to any specific Ig-isotype under stringent clonal conditions. Thus, the microenvironmental contribution of Peyer's patches to B-cell commitment for IgA expression is not as simple as providing a selective lymphokine. There may be other cell types in the mucosal microenvironment that participate in the programming B-cell switching. Mucosal dendritic cells are candidates for this role. Two recent in vitro studies indicate that IgA is expressed in high frequency when B-cells are cultured in the presence of dendritic cells from thoracic duct lymph or dendritic cells isolated by enzymatic disruption of Peyer's patches. INTRAEPITHELIAL LYMPHOCYTES. Intraepithelial lymphocytes (IEL) are a large heterogeneous population of immune cells in the intestinal epithelium. Two basic characteristics distinguish IEL from peripheral lymphoid cells. First, 80-90% of these cells are CD-8+/CD-4-, of which only half are Thy-l+. In contrast, the predominant phenotype of lamina propria T-cells is CD-4~/CD-8-. Secondly, isolated IEL exhibit in vitro effector functions which identify them as natural killer-like or Cytotoxic cells that are spontaneous or "natural" but without the identifying characteristics of NK cells. Further studies by Klein indicate that 40-70% of IEL bind a monoclonal that recognizes immature thymocytes and B-cells, but these cells also expressed the cytotoxic activation antigen despite being Thy-l-. At least some of the cytotoxic cells in the intraepithelial compartment may therefore be thymic independent. In mucosae, cytotoxicity directed toward virus-infected or otherwise parasitized epithelial cells would be prophylactic or protective because the lysed cell would be rapidly eliminated from the body in the mucosal stream. If IgA is also present, it would prevent reinfection of mucosal epithelium. The mucosal immune system is the most dispersed, the most diverse and the most complicated lymphocytic system in the body. Like the thymus, it plays a role in generating antigen reactive lymphoid cells which will become specific effectors upon further maturation and on the other hand the mucosal lymphatic tissues are responsible for inducing tolerance to antigens that are commonly experienced in the enteric canal. There is a great deal remaining to be learned about this important and enigmatic lymphoid system.